Twenty-four hours. One beauty blogger. Three random acts of beauty. Random Act of Beauty: October 24, 2007, 11:37 a.m. I go to a local burrito joint hungrier than a hippo, and I find out after I order my food that they only take cash. I’m short $1.50 and the walk to the atm seems farther than a trek through the Sahara. Plus my stomach is rumbling like crazy. I dig through the cusions and crevices of my car and I find nickels, dimes and pennies. When I add them all up, I find that I have exactly one dollar and fifty cents. Yes! Random Act of Beauty: October 24, 2007, 5:35 p.m. 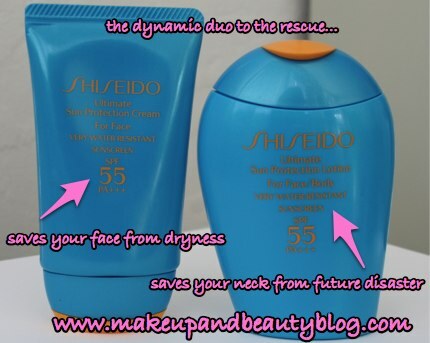 I finally find sunblock that doesn’t leave my neck feeling sticky, Shiseido’s Ultimate Sun Protection SPF 55 for Face & Body, at my local Macy’s Shiseido counter. That’s it on the right in the funny shaped bottle. The formula is a thin liquid that spreads easily and absorbs quickly. It has a nice smell and the finish is matte, so my neck doesn’t feel sticky and gross after application. On the left is the Face version. It’s incredibly moisturizing and so far hasn’t broken me out. Before I leave the counter with these goodies the nice Shiseido lady hooks it up! In addition to the gift-with-purchase, she gives me a generous handful of extra samples. Yes! October 24, 2007, 8:50 p.m. I finally get enough time to sit my bum down to watch the newest episode of I Love NY 2. 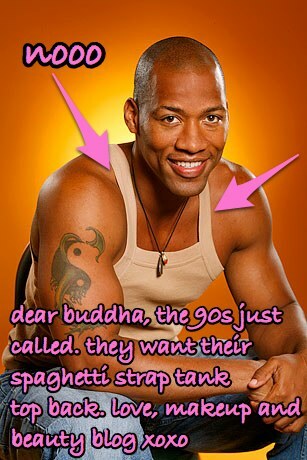 I admire one contestant, Buddha, and can’t help but think of El Hub. I thank the stars above that El Hub has the good enough sense to not sport this fashion faux pas. Yes! And while I’m at it, I also thank jeebus I’m not on a reality TV show looking for love amongst closet psychos, like The Entertainer. Yes! Any random acts of beauty happen to you lately? Please say yes! 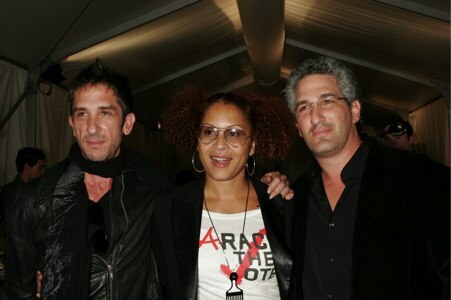 Mercedes-Benz Fashion Week in Los Angeles was last week. So maybe you weren’t hanging with Paris Hilton in the front row at the shows this year … but hey, neither was I! We’ve always got next year to look forward to, right? 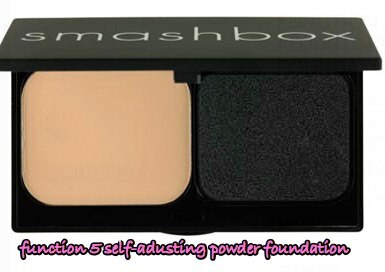 This year Smashbox sponsored the makeup. To absolutely nobody’s surprise, the flawless skin trend we saw at the San Francisco and New York shows was a big theme this year on the L.A. runways, too. Want to get the look at home? Here are a few tricks from Smashbox makeup artist Lori Taylor, who was nice enough to share a few backstage tips with Makeup and Beauty Blog. What was the biggest makeup trend we saw at the LA shows this year? Perfect and Flawless skin. During the shows we used tons of High Definition FX Foundation and Function 5 Self Adjusting Foundation. Also, smoky eyes of colors such as metallic green and purple. And bright lips with lipstick, not gloss! What tips can you give women who want to re-create these looks at home? Apply a sheer wash of color on the eye in black or brown, and then use metallic burgundy; soft, sheer purple; or taupe metallic shades. Use a ton of mascara and a liner in color. For the lips use a velvety lipstick or a sheer color. When you’re working backstage, what are your can’t-live-without Smashbox products? High Definition FX Foundation, Function 5 Self Adjusting Foundation and Photo Op Under Eye Brightener. We were all fighting for it backstage! 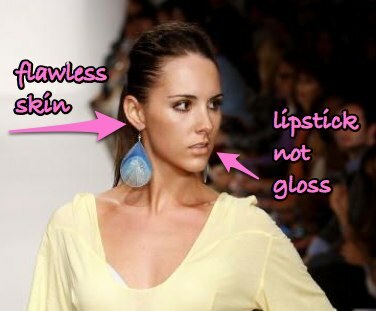 What is your favorite part about doing makeup for runway shows? I love the fast and chaotic pace as well as the responsibility of being the head makeup artist. My least favorite part is that I’m not so much hands on anymore. Once I create the look the other artists take over. I like to blog about whatever beauty and skin issue is plaguing me at the moment. The big problem du jour right now is my skin. I’ve been breaking out and getting dry patches…so NOT cute. When my skin goes nuts it means it’s time to review my skin regimen. I just switched to a cleanser which I’m starting to really love, Philosophy’s Purity Made Simple. The next step? Finding a complementary toner that both moisturizes and fights the good fight against pimples. Toners are liquid products that you use after you cleanse your face, and you apply it with a cotton ball to your face and your neck. The purpose is to take off the last traces of makeup and prep the skin for moisturization. Some toners also have other benefits, like fighting zits (yes!) and moisturizing (yessss!). I must confess; I’m not always an avid toner user. Sometimes I don’t feel like my skin needs it and sometimes I’m just plain lazy. If I can skip a step I’ll leave it out, ya know? But when my skin is going nuts like it is now I’ll make the extra effort to really baby it. Here are two toners that I’ve been test driving: DHC Rose Toner and Clinique Mild Clarifying Lotion. 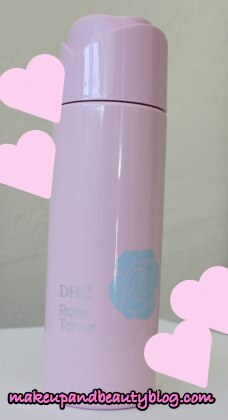 DHC Rose Toner is lovely-smelling toner made from distilled damask rosewater for ladies (and gents) with blemish-prone skin. When I was younger my skin was really oily, breakout prone and tougher than Tina Turner on a world tour. If I was ten years younger then DHC Rose Toner would be right up my alley. The dry patches on my face are a new thing for me, so unfortunately this toner was a little too drying to use over my entire face. However, Rose Toner did a fantastic job of drying up my zits. I’m going to use it as a spot treatment in the future, rather than an all-over toner. A 3.3 fl. oz bottle is regularly $21.00, but is on sale for $15.50 until November 30, 2007 on the DHC Web site. Also … a lil’ birdie told me that there’s a full Rose skincare line available in Japan but not in the US. It’s a DHC best seller and apparently the entire line is phenomenal. I’m crossing my fingers and hoping that they make it available in the US soon! Clinique Mild Clarifying Lotion, Where Have You Been All My Life? Before I buy new skin care products, I read other beauty blogs and check sites like makeupalley.com first. I like to do background research on a product because it gives me a good idea of what it does and whether or not it might work for me. I got the idea to try Clinique Mild Clarifying Lotion from the skin care board on makeupalley.com and all I gotta say is PRAISE JEEBUS! This stuff is the sh*t! Clinique Mild Clarifying Lotion is a gentle exfoliator that contains salicylic acid, a beta hydroxy acid. It’s moisturizing, doesn’t have an offensive smell and is so far doing a great job of clearing up my skin. I wanted to add a salicylic acid (BHA) treatment to my daily skincare routine because I’ve read that for some people, the combination of benzoyl peroxide with a BHA works wonders to keep skin pimple-free. How do these two work to keep breakouts at bay? BHA is a chemical exfoliant that keeps pores clear, and benzoyl peroxide kills acne bacteria present in the pores. So far this combination has been working for me quite well. My pimples are starting to clear up, and my skin doesn’t feel as dry and tight. If you go to the Clinique counter to buy this don’t let the MUA talk you into any other toner. I went in after work one day and I hadn’t blotted in a few hours so my skin looked really oily. The makeup artist tried to push the “oily skin” toner on me. I’m glad I stuck to my guns because Mild Clarifying is a new skincare staple. I love, I love! A 6.7 oz bottle is $11.00, available at Macy’s, Nordstrom, Bloomingdale’s and Sephora. I’ve been having a weird few days. – I go to the local Punjabi Burrito place (I’m so not kidding) in Marin to buy a Punjabi Burrito and find out when I get to the counter that they don’t take credit cards; it’s cash only. And of course I only have five bucks on me and the Punjabi Burrito costs $7.50. And of course I’m hungry enough to start gnawing on my arm. – Every night for the past few days I’ve been waking up at 3:00. No rhyme, no reason. The clock hits 3:00 and there I am. Ready to knit, do calculus, build a better mousetrap, blog. You name it, I can do it at 3:00 in the morning because I’M WIDE AWAKE. – Random neighborhood cats have been wandering into my apartment. The weather’s been hot so I’ve been leaving the front door open when I write. The cats come in. They sniff around the random beauty products strewn across the floor. They meow. They leave. They always leave. I feel cheap and used. I dunno, maybe it’s mis-alignment of the planets or perhaps something is in retrograde. Anyway, I hope that your week’s been going well and that it’s going by fast. 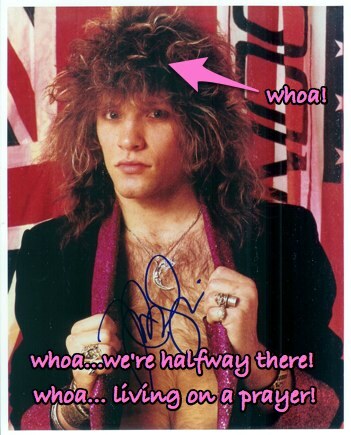 Hey, at least we’re halfway there! 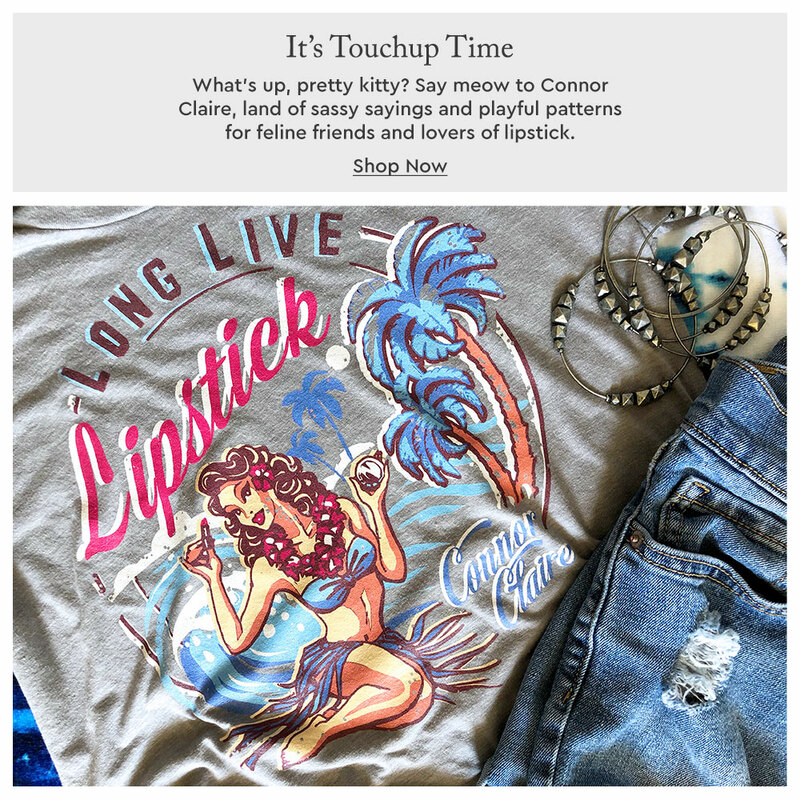 Rock on…it’s all we can do! There are 26 comments on this post. Leave yours. Earthworm. Dirt. Fig Leaf. Wait, did I make a wrong turn somewhere? Is this gardening 101? Nope! These are just a few of the unique scents in the Demeter Fragrance Library, a fragrance company that creates unusual scents from everyday life. The amazing thing about the fragrances is that they always hit the scent on the nose (pardon the pun), and each scent is an accurate replica of the original smell. When I got a first whiff of one of the newer scents, Crayon, it reminded me of being a kid, opening up a fresh box of crayons, and spending hours with my coloring books. Another new scent, Pure Soap, is also delicious. It smells just like a freshly showered husband (or boyfriend! )…ahhhh, yummy. Other times it’s a matter of chemistry. Two scents that the company has been working on for years, Puppy’s Breath and Baby’s Head, are still in production because of this issue. Natural scents often involve large, organic molecules, which are difficult to replicate, says Crames. 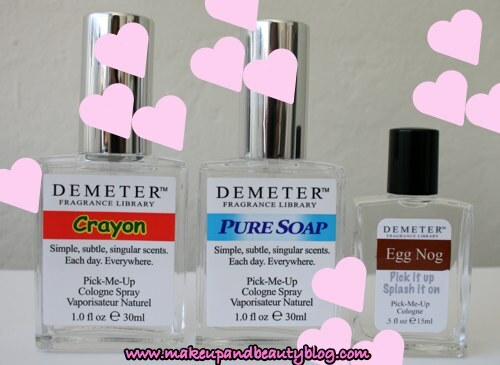 Demeter’s got some delish fragrances for the holidays, including a new scent called Egg Nog. And if you’ve got stockings to stuff, head on over to their Web site, because they’ve got an exclusive offer where you can purchase HUMUNGOUS MINIS (a full Â½ oz of fragrance) of any of the scents for a mere five duckets. Can’t decide? Pick up one of my three faves: Thunderstorm, Gingerale or Kahala Hawaiian Surf. It was so beautiful here in the Bay Area today; I hope you were able to catch some sun. I’m off to the gym right now to lift weights and hopefully burn off the gelato I ate for lunch! I don’t have many regrets in life. However, one huge regret that’s been bugging me lately is that I wish I would’ve taken better care of the skin around my neck. It feels like one morning I woke up, took a look in the mirror and BAM! Neck lines! Rough skin! Wrinkles! I’m a big fan of wearing sunscreen as an anti-aging treatment and have been slathering it on my face since I was a teenager. I don’t like the feeling of having a sticky neck, so I’d always skip out on slathering it all over my neck. I really regret that now. In the effort to make up for lost time, I’ve been trying to take better care of my neck, and one thing that I’ve been doing lately is washing it with a Micellar water cleanser. 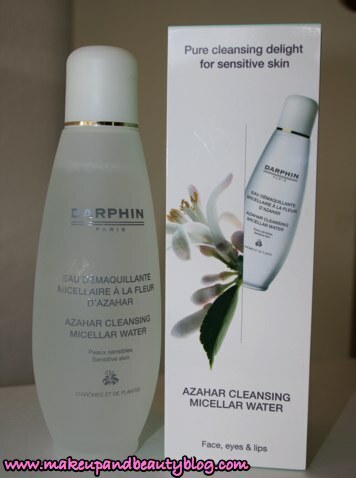 Several French skincare lines make Micellar water cleansers, which are liquid cleansers that you use without water. They usually come in a bottle in liquid form. You apply a lil’ bit on a cotton pad, wipe your skin down with the moistened pad, and then voila! Your dirty birdy self is clean because there’s no need to rinse off with water. Micellar water cleansers are usually geared towards sensitive skin and sometimes the formulas also combine the cleanser with toner or moisturizer. The weather is getting cooler round my â€˜hood which means that in the morning, my bathroom turns into a freezer. It gets so cold that I can’t bear to wash my neck because that means I have to take off whatever sweatshirt/long sleeve shirt I’m wearing. And if I leave on whatever shirt I’m wearing I get water and soap down my shirt. It’s not a pleasant way to start the day. 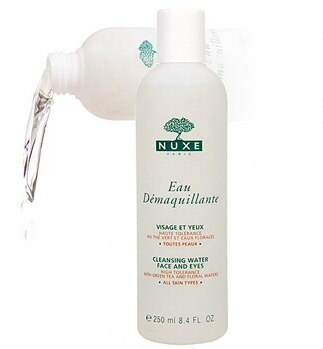 Nuxe is a French company that uses plants and essential oils in their products. Their producuts also contain no animal substances, mineral oils or artificial colors. I’ve used a few products in the past and remember really liking the line. I think when I run out of Darphin this is the next brand I will try. Caudalie’s line is based on polyphenols found in grape seeds. In the past I’ve used both Energizing Cream, an anti-aging moisturizer, and Gentle Cleanser, a cleanser containing free radicals. I liked the products because the didn’t irritate my skin are were very gentle. In addition to a full skin care line they have several “Vinotherapie Spas” with grapevine-derived anti-aging treatments. One is located a stone’s throw away from me in Sonoma. Girl’s spa day, anyone? Avene skin care products are geared towards those with sensitive skin and healing skin conditions like dermatitis, psoriasis and eczema. The key ingredient in their products is the therma spring water that flows from France’s Cevennes Mountains. I’ve got a soft spot for both French skin care (my last name is French, haaaaaaay!) and Japanese skin care. I don’t know if it’s clever marketing, but these brands do seem to have products that appeal to my sensibilities. Do you have any favorite foreign skin care lines? Besides mangling the French language, when I went to Paris a few years ago one of my favorite things to do was to go into stores and pharmacies to look at all the weird and unusual lines they offered. Paris is one of my favorite cities in terms of style, culture and carbs — OH! THE BREAD! I can’t wait to go back. Anyway, I hope your Monday is off to a good start, and I raise my cup o’ coffee to you. Keep fighting the powers that be! Feast your eyes upon the early Miracle that is Boots No. 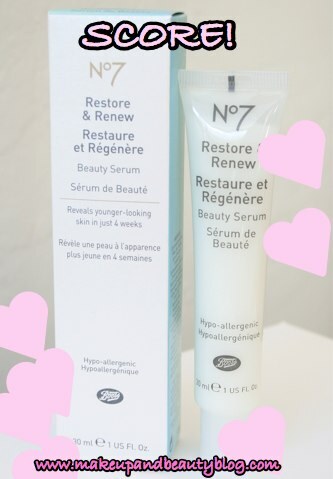 7 Restore and Review Beauty Serum! For the last four months I’ve been scouring Target (“Tar-ghay”) for this alleged miracle cream from across the pond. And every time I go it’s always out of stock, boo! But yesterday the stars were aligned and for the first time ever I was finally able to get a tube, yay. Women all over the UK went buck wild after a program on BBC, Professor Regan’s Beauty Handbook, showed scientifically that No. 7 Restore and Renew (known as “Protect & Perfect in the UK) repaired photo-aged skin and improved the fine wrinkles associated with photo aging. After the show aired, sales increased by nearly 2000%, with 13 bottles being sold every minute. I’ve only used it one night so I can’t give a thorough review quite yet, but I was so happy to finally get a tube that I thought it was worth a big fat shout out of blogger joy. I have high hopes for this one. $21.99 for a 1 fl oz tube. Right next door to Target is a Sephora, which is a recipe for both danger and ecstasy. I picked up two goodies from Philosophy, Purity Made Simple One Step Facial Cleanser and Kiss Me Very Emollient Lip Balm in Clear. I have adult acne that’s mostly cured, but lately my skin has been acting a little nuts. I’m breaking out on my cheeks and on my forehead. In addition to the breakout, my skin has also been tight and dry. Everything I’ve been using to wash it with lately has been leaving my face feeling tight, even my good ole’ standby Cetaphil. I read an article on Jeni’s blog over at Savvyskin.com on how she cured her adult acne and one of the products she raved about was Purity Made Simple cleanser. I used it for the first time last night and this morning. It doesn’t leave my skin feeling tight and cleanses thoroughly. The only negative so far is that it did not remove waterproof mascara. Other than that I’m liking it so far. I hope it doesn’t break me out! $10 for a 3.5 fl oz large sample tube. The change in season is also wrecking havoc on my lips, which are flaky and dry OVERDRIVE. Ugh. It seems like every three or four days I end up peeling half my lip skin off (gross, I know). I’m glad I picked up this tube of Kiss Me Very Emollient Lip Balm, does a fantastic job of moisturizing my lips. Kiss Me also comes in Red (sheer berry) and Pink (sheer rose-pink). I love the Red, which smells and tastes like oranges, but can’t stand the Pink. Pink has a weird, pepperminty taste and gives my lips an uncomfortable tingle. I keep a tube on my nightstand and slap on a thick layer before I go to bed. In the morning my lips feel super soft! $10 for a 0.5 oz tube. This weekend went by so fast! It was beautiful here in the north bay. I went running yesterday and went for a long walk today around my neighborhood. I know these sunny days are numbered, so I feel like I have to spend as much time as I can outside before it starts to really get rainy and cold. I hope you had a great weekend and that it was both relaxing and productive.